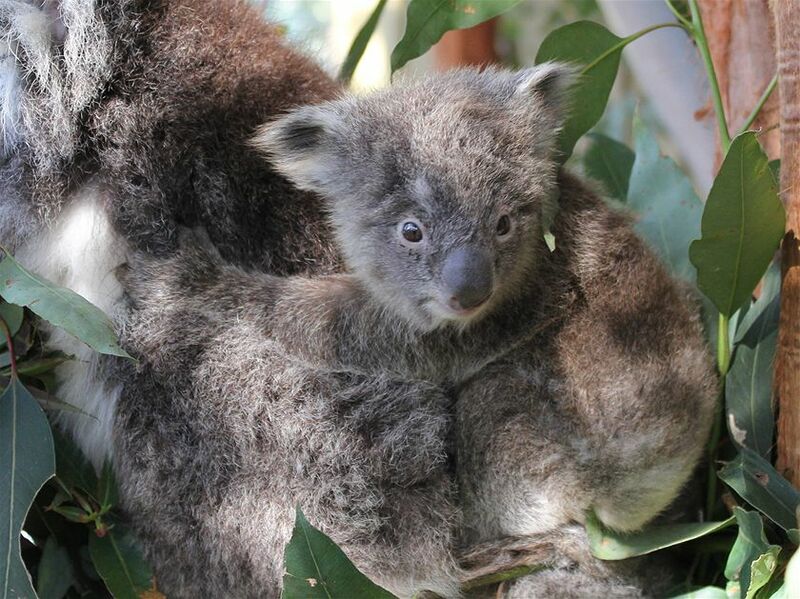 Logging operations planned for Tanja State Forest are on hold after a recent survey found evidence of koalas in one of the proposed logging compartments. A Forests NSW spokesperson today confirmed that the operations will not proceed until the harvest plan is amended with appropriate koala protection prescriptions. TORONTO – Sino-Forest Corporation today provided a status update regarding its efforts to collect accounts receivable owing to subsidiaries of the Company… As at March 30, 2012, a total of $79.6 million was owing to wholly foreign-owned subsidiaries of Sino-Forest, a total of $887.4 million was owing to British Virgin Island (BVI) subsidiaries from authorized intermediaries arising from the sale of standing timber forestry assets and a total of $126.2 million was owing to other BVI subsidiaries from the sale of imported logs and wood products. Pulp only accounts for about 15% of Domtar Corp.’s earnings, but the volatile commodity nonetheless tends to be a key driver of the company’s share price. So while prices for northern bleached softwood kraft (NBSK), the paper industry’s benchmark for pulp, may take some time to recover given that China is oversupplied, JPMorgan analyst Phil Gresh thinks they may be near a bottom. If that’s the case, Domtar should begin to perform better, as it did in both 2010 and 2011, the analyst told clients, upgrading the stock to overweight from neutral. RICHMOND, B.C. _ Pulp and paper producer Catalyst Paper has announced the permanent closure of its Snowflake recycle mill in northeastern Arizona and its subsidiary, the Apache Railway Company. The move will put 308 workers out of a job after production at the operations shuts down on Sept. 30. The Richmond, B.C.-based company cited flagging demand for newsprint, price volatility and higher freight costs as reasons for the closure. Domtar’s Kamloops pulp mill is likely eking out a small profit at today’s falling prices, an analyst said Friday. The international pulp and paper producer reported net earnings of $59 million in the second quarter of this year. That compares with $54 million for the same period in 2011. Revenues were down slightly to $1.37 billion. BEDFORD, Mass. RISI, the leading information provider for the global forest products industry, today announced Mr. Richard Garneau, President and Chief Executive Officer of Resolute Forest Products, has been selected as RISI’s 2012 North American CEO of the Year. RISI, the leading information provider for the forest products industry, gives the award to honor industry leaders who have made significant achievements over the past year. It’s been a good summer for sawmills in northeastern Ontario — and that has some thinking optimistically about the forest industry for the first time in years. More Americans are building houses this summer, bumping up lumber prices. This is good news for the mill in Nairn Centre, located west of Sudbury, which was purchased by Eacom from Domtar two years ago. The Nairn Centre mill still has a key client in Domtar’s Espanola pulp and paper mill — where Eacom’s Brian Nicks said his company sells the leftover wood, which is still a big part of their business. Weyerhaeuser (NYSE: WY) had its price target upped by Deutsche Bank from $19.00 to $23.00 in a research note released on Monday morning. They currently have a buy rating on the stock. NEW YORK — Demand for fencing in the US is forecast to expand 7.1 percent per year to $8.3 billion in 2016, totaling 835 million linear feet. Growth will be driven by an expected rebound in building construction from a depressed 2011 base. In addition, advances will be supported by rising use of high-value fencing materials, such as ornamental metal and plastic and composite lumber. Consumers will opt for these materials because of their favorable aesthetic qualities and performance properties. Harvard University is reaping the rewards of investing in plantation forests in New Zealand when forestry investments were unfashionable. At a CNBC Delivering Alpha Conference where many fund managers talked about shorting the euro and the dire state of European bond markets Jane Mendillo, chief executive of Harvard Management Company, said she really liked natural resources, and in particular timberland. It was a rare appearance from the head of the secretive company that manages the $US32 billion endowment of the ivy league university but the position is consistent. BLAINE, Wash – Hollund Industrial Marine announced today that the company expects by Friday, August 2nd, 2012, to have completed negotiations concerning the company’s acquisition of an exclusive license for the patented underwater logging technology. “For the past few weeks, we’ve been negotiating with the technology owner to secure a multi-year exclusive agreement for the rights to market and operate the patented underwater timber harvesting robotic system,” stated Peter Meier, President of Hollund Industrial. Californians may see a new tax placed on the purchase of lumber products, with Gov. Brown’s proposed Timber Harvest Plan Reform, which includes a new tax on the sale of lumber products, designed to support state regulatory agencies. Rather than reforming the aggressive regulations placed on the timber industry, the governor’s office is suggesting new taxes to pay for the regulations. This tax may very well force small businesses and consumers to look outside the state to purchase lumber products, further weakening the California economy. A new 500,000 ton per year pellet production facility in Southampton County, Va. represents the biggest economic development in the county over the past 20 years, according to Michael Johnson, Southampton County administrator. The pellet production facility will be owned and operated by Maryland-based Enviva LP, and following the recent groundbreaking held at the 139-acre site Enviva purchased for $1.5 million, the facility will be operational by the end of 2013. NEW YORK — Deltic Timber Corporation has been upgraded by TheStreet Ratings from hold to buy. The company’s strengths can be seen in multiple areas, such as its revenue growth, increase in net income, largely solid financial position with reasonable debt levels by most measures, solid stock price performance and growth in earnings per share. At the beginning of the third quarter, the majority of central European shippers have been unable to get importers on the softwood lumber markets of North Africa and the Middle East to accept higher selling prices. 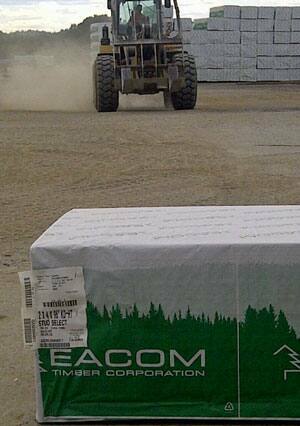 From what shippers say, importers still have an adequate supply of softwood lumber even for prompt deliveries. NEW YORK — Scholastic Inc., the global children’s publishing, education and media company, today announced another year of significant progress toward the company-wide goal of strengthening its sustainable paper procurement practices and increasing the percentage of Forest Stewardship Council – certified and post-consumer waste recycled paper purchased by the company. CINCINNATI, OH – A national shortage of technically qualified employee candidates may be impacting the woodworking industry as well. Ad-Ex International Inc., the 125-employee Cincinnati-based exhibition and retail display manufacturer says it has had six positions open for months, but cannot fill them. Mike Pierdiluca, co-owner of Ad-Ex, tells the Wall St. Journal he gets hundreds of applications for job openings, but most are unqualified. “Based on present economic conditions, we have to be cautious,” Pierdiluca told the Journal. “It’s expensive to train someone.” Younger job seekers don’t have carpentry and painting skills, and one spot has been open for more than a year, he says. The UK’s private sector forests will see a rise in their production of softwood timber over the coming 25 years, according to Forestry Commission research… This is due to extensive planting of new conifer forests between 1960 and 1990, which is set to result in a peak in the potential amount of timber available for market. However, the commission noted that the actual amount of timber that will be harvested is dependent on environmental and operational constraints. The province will encourage a forest company with rights to log in watersheds above Pritchard to work out differences with residents of the rural community. The board of the Thompson-Nicola Regional District asked the Ministry of Forests, Lands and Natural Resource Operations on Thursday to place a stop-work order on logging in the Martin Creek and Laveau Creek watersheds… A joint venture by Tolko Industries Ltd. and Neskonlith Indian Band has a licence to take the equivalent of more than 1,000 logging truck loads of timber from the watersheds of the two creeks. An evacuation alert has been issued for approximately 50 properties in the Wilson’s Landing area of West Kelowna, B.C., after a wildfire jumped a fireguard late Sunday night. The fire was sparked by lightning on Friday and was declared contained by noon on Sunday. However, on Sunday night winds in the area picked up and fanned the flames and on Monday morning officials said what was a fire of 4.4 hectares had grown to 26.6 hectares, and was only 20 per cent contained. EDMONTON – Environmentalists say new deals signed between the Alberta government and two forestry companies will make it harder for the province to balance industry and conservation. The Alberta Wilderness Association says the 20-year forestry management agreements, posted last week, tie Alberta’s hands as it writes land-use plans to manage increasing pressure on public forests. “The government is sending an unfortunate signal that just looking at the forest as timber supply seems to be the direction it wants to go,” said spokeswoman Carolyn Campbell. VICTORIA – The government of British Columbia has provided $50,000 to enable a tribute in music, poetry and stories honouring the BC Forest Service’s 2012 centennial year to tour the province. Inspired by the logger poetry of Robert E. Swanson, B.C.’s Bard of the Woods, “Good Timber – Songs and Stories of the Western Logger” presents a spirited depiction of life in the logging camps and communities central to the cultural legacy of forestry in British Columbia. Port Alberni’s Hupacasath First Nation has signed off on an agreement with the provincial government that compensates the tribe for the removal of private land from Tree Farm License 44. TFL 44 lands are part of 232,000 hectares that comprise the traditional territory of the Hupacasath. The lands in question were removed in 2004. The tribe will receive $305,000 over five years for consultation purposes. The Thursday, July 19th edition of your newspaper published two letters to the editor, respectively from representatives of the Nova Scotia Woodlot Owners and Operators Association and the Friends of Redtail Society. These letters offered positive suggestions to government about long term environmental and economic forest sustainability and engagement of local communities in forest resource management. An underlying theme common to each is the contention that provincial policies regarding Nova Scotia’s forests have been far too heavily weighted toward industrial approaches to forest resource development, for pulp and paper manufacture and export. Lightning-caused forest fires continue to concern Ministry of Natural Resources fire managers. Over the past three days almost two dozen new fires — seven on Wednesday alone — have been started by lightning strikes in Northwestern Ontario. Fire information officer Heather Pridham said “lightning associated with some pretty heavy rainfall” moved through southern areas of the region on Thursday and dropped the fire hazard to low and moderate south of the Trans-Canada Highway. In the past 20 years they’ve come by the thousands, flocking to the plains of southern Saskatchewan – moose of every shape and size. Typically creatures of the boreal forest and the heavily wooded north country, where 50,000 moose are found, in recent years an estimated 5,000 to 7,500 moose have been living in the wide open prairies of southern Saskatchewan. As evidenced by the latest fatality – RCMP Const. Derek Pineo, killed while on a late-night call after his police cruiser collided with a moose on Highway 14 near Wilkie – moose collisions pose a much higher risk of death. WASHINGTON — The U.S. Department of Agriculture’s Animal and Plant Health Inspection Service is asking the public to be on the lookout for the Asian longhorned beetle (ALB). August is a time of peak emergence for the devastating invasive pest and a critical time for building the public’s awareness of ALB. ALB was first discovered in the United States in 1996, likely arriving via wood packing material from Asia. In a July 23 commentary, David Young argued that the U.S. Green Building Council’s LEED program is flawed because it only gives credit to Forest Stewardship Council-certified wood, excluding other admirable programs such as Tree Farm. All forest certification programs deserve immense recognition for improving forest management, and there’s little value in pitting them against one another. FSC does deserve special recognition because it’s the world’s most rigorous standard for addressing the broad array of complex ecological, economic and social sustainability issues that pervade forest management. U.S. Forest Service employees throughout the west say an Environmental Impact Statement or an Environmental Review can take from one to ten years to complete. Upon completion, there is an additional process for logging contracts or to thin trees on our National and State forest lands. Upon conclusion of that process, environmental groups file lawsuits to stop any logging while homes burn along with our forests and in some cases causing deaths… As environmentalists fight to stop all logging in the forest, one has to wonder if they are just stupid or do they realize what dangers they are permitting to families, their homes and the forests. The U.S. Forest Service is dismissing a study it commissioned that recommends a major overhaul in its approach to fighting wildfires, suggesting swapping out expensive retardant-dropping air tankers in favor of less costly water-scooping planes. A Rand Corp. study examined the optimal combination of large planes and helicopters deployed to fires, providing an analysis of the effectiveness and efficiency of each type of aircraft. …But the Fillmore County Soil and Water Conservation District hopes to teach folks a bit more about our arboreal neighbors. The district’s Forestry Field Day will be held just west of Chatfield today… The seminar will include a walk along private property in Fillmore County as well as a short trek down the Lost Creek Hiking Trail…“They’ll be talking about basic forestry, how to identify trees, forestry management and what your trees are worth,” Ryg said. LITTLE ROCK, Ark. – The Arkansas Forestry Commission wants legislators to approve a $1.9 million budget hike next year so it can restore 20 positions that were cut after the agency ran into financial trouble. State Forester Joe Fox told a legislative committee Thursday that 13 of the 20 positions would be for firefighters. The Southwest Times Record reports (http://is.gd/zpMxtR ) that Fox wants to be able to send out firefighters in relief of those who need a rest. KANSAS CITY, Mo. — An insect that destroys ash trees has arrived in the Kansas City area, and officials in neighboring Kansas said they’ve been working to halt the pest’s westward movement. The Missouri Department of Agriculture said the emerald ash borer, which eats and kills ash trees, has been found recently in Platte County. The insect, which was first found in the U.S. in 2002 in Michigan, is thought to have been brought to the country from Asia in cargo ships. The ash borer has since spread to more than 15 states, primarily through firewood. It was first detected in Missouri’s southeastern section in 2008. 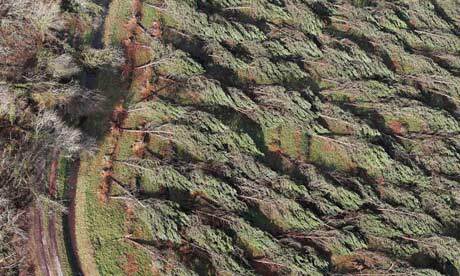 CASS LAKE, Minn. – Forest managers are trying to determine how best to clean up fallen trees scattered across miles of public lands after straight-line winds roared through northern Minnesota in early July. The July 2 storm knocked down hundreds of thousands of trees from Bemidji to Grand Rapids. Norway Beach on the south shore of Cass Lake was hit hard. Giant, old-growth red pines — many between 100 and 200 years old — are strewn across the landscape, Minnesota Public Radio News reported Friday. Tempers have run high at a forestry debate near Hobart with a sawmiller ejected by police and the meeting calling for an early election. The Resources Minister, Bryan Green, went head-to-head with Opposition Leader Will Hodgman over the industry’s future. About 150 people attended the debate in Brighton, mostly frustrated forest workers and their families. Planet Ark is one of Australia’s highest profile environmental groups, backed by celebrities like Pierce Brosnan and Kylie Minogue, and famous for its campaigns on recycling and tree-planting. But the charity, cofounded by tennis great Pat Cash is under attack from its fellow green groups, accused of selling out to the forest industry. 7:.0 has learned that Planet Ark has accepted hundreds of thousands of dollars in sponsorship from a timber lobby group and allowed its logo to be used on advertising for wood products. Tonight the organisation’s founders speak out for the first time in this exclusive report from Adam Harvey. Siberian cities are cloaked in smoke from raging wildfires whipped up by winds. The blazes are raging in five regions, covering an area over 22,200 acres (90 square kilometers). ­The situation is hampered by extreme temperatures. And though all flights in the regional city of Omsk have been grounded by the blaze, firefighters say it poses no threat to populated areas or industry. Thick smoke is holding back containment work and is preventing the emergency planes and helicopters from reaching the worst-hit areas. USDA program aids three Maine wood pellet cos.
Three Maine wood pellet companies are among 125 biofuel producers nationwide receiving payments under a U.S. Department of Agriculture program designed to support the production and expansion of advanced biofuels from a wide variety of sources, including waste products. The funding is being provided through USDA’s Bioenergy Program for Advanced Biofuels. Under this program, payments are made to eligible producers based on the amount of biofuels a recipient produces from renewable biomass, other than corn kernel starch.